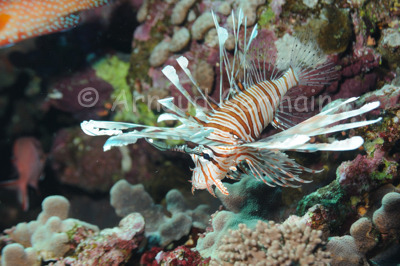 When displaying like this, lionfish are one of the beautiful and impressive fish on the reef. They are poisonous though and divers must not get too close. This one displayed when I tried to approach to get the picture. Of all places, I took this picture on the Eastern drop-off of Elphinstone Reef, which is renowned for the big pelagic fish, not the small reef fish. Nikon D700, Nikon 28-105 mm macro at 92mm, F8, 1/60th, ISO 200, Ikelite Housing and Ikelite DS160 strobe set on Manual x1/8. Elphinstone Reef, East Drop Off, about 20 metres down, Marsa Alam, Egypt.